Presenting a diamond ring can be one of the grandest gestures a man will make so it should be almost perfect. Many choose Valentine's Day as a romantic time to pop the question. With February 14 right around the corner, selecting the ring is a difficult and anxiety-filled process. Educating yourself before purchasing that once-in-a-lifetime piece will ensure you get exactly what you want (and what she wants). I'm no expert on engagement rings, or diamonds for that matter, so I went to a real expert to learn about these precious stones and understand what to look for when buying diamonds. Ji Song, co-owner of Engage Diamond Studio, walked me through his gorgeous studio and explained the four most popular characteristics of the stones: Carat, Clarity, Colour and Cut. 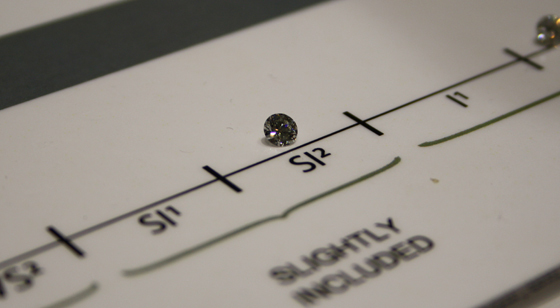 These characteristics are just the tip of the brilliant iceberg but help to distinguish quality diamonds. Carat is a measure of weight, not size. A larger diamond is not necessarily better. As the weight of the diamond increases, so will the price. As Ji explains it, if a 0.50 carat round diamond sells for $1,500 you can expect to pay more than triple that, if it was a 1.00 carat round diamond (with all other qualities being the same). A .75 carat diamond is very close to a 1 carat in size, but the costs can be much greater. Side note: Carat for diamonds is different than Karat for gold. Clarity refers to how clean the diamond is. All diamonds have imperfections (flaws). On the low end of the scale you can see the imperfections with the naked eye, on the high end of the scale are the very rare (and expensive) flawless stones. SI1 and SI2 are in the middle of the scale, with some imperfections but you'll need a microscope to see the flaws. 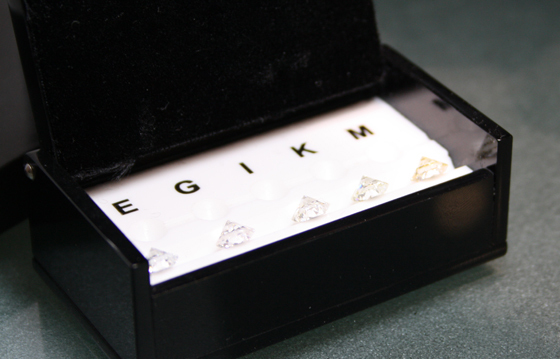 Diamond colour is rated on an alphabet scale D to Z. D being the most rare with no yellow and Z being very yellow. Most diamonds exhibit a yellow/brown colour naturally. The rule of thumb when it comes to colour is the more yellow in the diamond, the less valuable it's going to be. To see the true colour of a diamond, you need to view it under a special diamond light that neutralizes light. The proper way to view the colour is to have the diamond angled on the flat side. The most important factor out of the four C's is cut. How well a diamond is cut will affect the appearance of the stone from the top down and will impact how light shines through the stone (a.k.a. "the sparkle"). The other three characteristics are determined by nature, cut is the only human interaction that brings out the sparkle. Deep cut - With this cut, all the weight is in the base so the diamond looks smaller from the top down. Over 80-85 per cent of diamonds are cut this way because it is the cheapest and fastest way to cut a stone. With this cut, a lot of the light shining into the diamond is going to leak out the side, making it look dull from the top down. Buyer beware: Be careful in jewelry stores, not only are they knowledgeable about diamonds, they are also experts in lighting. The problem is the moment you leave the store, the diamond will never look exactly the same as it did in the store because of the carefully placed lighting. Shallow cut -- The diamond may look bigger with this cut but the problem is the light shines right through and leaks out the bottom. This can create a 'black hole' effect, or what diamond experts call a 'fish eye'. Ideal cut -- Somewhere in between deep and shallow cut is the ideal proportions. Light will enter and shoot back up, allowing for that brilliant sparkle. Armed with this new knowledge about diamonds, you're ready to shop around to find that perfect ring.